Sustainable landscapes rely on native plants that are well adapted to the climate and site, thus reducing or eliminating the need to use pesticides, fertilizers, or supplemental watering once the plants are established. A wide diversity of plants provides color and interest to the sustainable landscape. 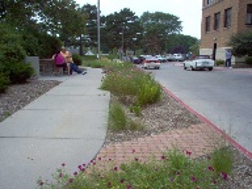 Native and adapted tree and shrub species have been planted in this large green space. 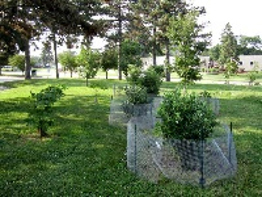 Fencing protects the new plants from rabbit damage until the plants get established. A cost-effective approach to managing stormwater that can provide many community benefits. 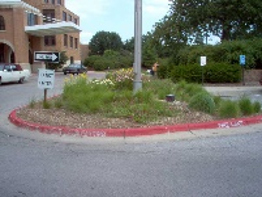 It can reduce and treats stormwater at the source while providing environmental, social, and economic benefits. A "Built in place” Green Roof means the soil material was hauled up to the roof and put in place. 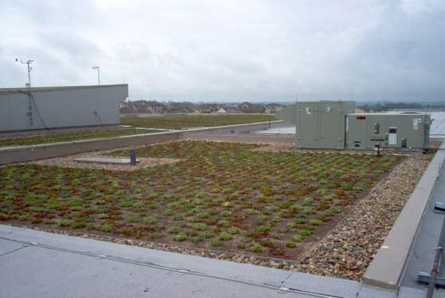 Then the plants were planted directly onto the roof.